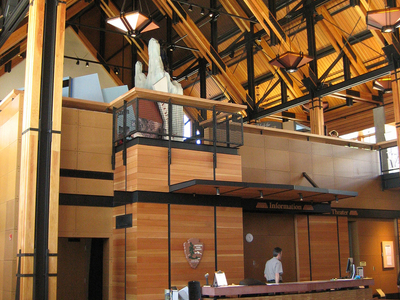 The Henry M. Jackson Visitor Center is a day-use facility located in the Paradise area of Mount Rainier National Park. The facility offers exhibits, films, guided ranger programs, a book store, a snack bar, and a gift shop, as well as public restrooms, and informational brochures and maps. 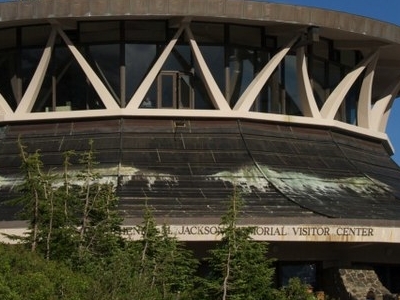 The first Jackson Visitor Center opened in 1966 as part of the National Park Service's Mission 66 program. Originally known as the Paradise Visitor Center, it was renamed in 1987 after the death of Senator Henry M. Jackson, who had been instrumental in the development of the program at Mt. Rainier. Construction of a new Jackson Visitor Center was completed in 2008 and the original building was demolished in the spring of 2009. Mount Rainier was a pilot park in the Mission 66 program to expand National Park visitor services. The plans for the Paradise Visitor Center as a day-use facility came about as a compromise when the program was still trying to determine whether overnight lodging would be feasible. Construction began in 1964, and was to include a restaurant, museum, information center, ski rental shop and a warming hut. By the time construction was completed in 1966, costs had grown to $2 million. Category:Visitor Centers in RandleHelpful Links:Randle Overview References: 336816, 1883058 Claim:If you are the owner of this property claim it?